Portugal flew home today after the second-best World Cup in their history still waiting to discover if coach Luiz Felipe Scolari , who has given them a new cutting edge, will carry on. Coaches and tactics dominated this World Cup rather than the players themselves, says French great Michel Platini. The World Cup final generated a lot of excitement among residents of the City Beautiful, who enjoyed the grand finale at their homes or on big screens put up especially at various clubs, hotels and discotheques here tonight. Juergen Klinsmann has done more than merely silence his critics after coaching Germany to a surprising third place finish at the World Cup. He has turned those who criticised his methods and wanted him to quit just four months ago into ardent supporters who are now begging him to stay on with the national team. 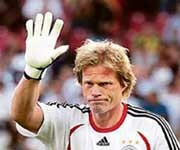 Germany goalkeeper Oliver Kahn announced here on Saturday after his country won the World Cup third-place playoff against Portugal that he was ending his international career. Germany captain Michael Ballack admits his dream of lifting the World Cup is all but over as he will be almost 34 when the 2010 World Cup in South Africa comes along. Get Ronaldo permanently and play with him! Don’t get startled. The international dog bazaar would be organising a different kind of auction in which football lovers can purchase a canine sharing the name of their favourite football star, be it Ronaldo or Zinedine Zidane. FIFA and the European Commission signed a memorandum of understanding for promoting football in Africa, the Caribbean and Pacific countries here today. Roger Federer wrapped up his fourth consecutive Wimbledon title today, finally subduing Spain’s Rafael Nadal 6-0, 7-6, 6-7, 6-3. It looked as though the world number one would run away with his eighth Grand Slam title after rampaging through the first set in 24 minutes before double French Open champion Nadal recovered to make the Swiss maestro sweat on a breezy Centre Court. India’s hopes of winning their first ever Asian junior badminton title were dashed as starlet Saina Nehwal bowed out in the third round of the girls’ singles event at Kuala Lumpur, Malaysia. Indo-Swede Daniel Chopra slid from a birdie spree on the second day to a bogey spree on the third to play a nightmarish front nine and finish the round with a five-over 76 at the $ 5 million Cialis Western Open golf tournament here. The upcoming ICC Champions Trophy featuring six top cricketing nations may run into rough weather with the Punjab State Sports Council (PSCC) and the Punjab Cricket Association (PCA) entering into a war of words over the lease of land of the stadium. Indian challenge came to a disappointing end with Rupesh Roy and Hsin Han Lee of Chinese Taipei faltering at the semifinal hurdle of the boys’ doubles event at Wimbledon. Visually challenged raring for blind cricket World Cup. Portugal flew home today after the second-best World Cup in their history still waiting to discover if coach Luiz Felipe Scolari, who has given them a new cutting edge in the last three-and-a-half years, will carry on. They will also be contemplating a future without captain Luis Figo, who has been a fixture in the team for the past 15 years, while controversial winger Cristiano Ronaldo must be wondering what reception awaits him at Manchester United. Figo, 33, announced his international retirement following Saturday’s 3-1 defeat by hosts Germany in the third-place playoff match, although he also said he was quitting two years ago only to change his mind. He has won a Portuguese record 127 caps since making his debut at the age of 18 against Luxemburg in 1991. Scolari, who led his native Brazil to their fifth world title in 2002, has helped Portugal cast away their reputation as perennial under-achievers since bringing his unique coaching style to an unsuspecting Europe at the start of 2003. “Big Phil”, who invariably puts on his own private show along the touchline as he rants and gesticulates wildly, has already taken Portugal to the European Championship final as hosts in 2004 and this year’s World Cup semifinals. Yesterday’s defeat meant they just failed to emulate the Eusebio-inspired team of 1966, who finished third. Scolari, who rejected an offer to coach England before the tournament, has said he needs a few days to ponder his future. The coach said before the third-place game with Germany that money was not his main consideration. “It’s the coaches’ World Cup, and I could also have called it the World Cup of tactics,” Platini said. “Things have changed, because 20 years ago it was the players’ World Cup. There was more freedom then, whereas now everything is dominated by tactics.” He, however, added that football has not become “poor”. “It just depends more than ever on what the coaches come up with,” he told the tournament’s official website. “And in this tournament, the formations have been rather defensive. In terms of the football on offer, I don’t think Germany 2006 will go down in the annals,” said Platini, who led the French to European Championship honours in 1984. He felt that for France, the key to the final would be the interaction between playmaker Zinedine Zidane and striker Thierry Henry, a “link-up fundamental to the team”. For the Italians, he said, it will be creative midfielder Andrea Pirlo and how well he can bring his team-mates into the game. Many young enthusiasts were seen dancing at midnight to celebrate Italy’s victory. Die-hard Italy fans — Vikas, Tarun, Rahul, Annesh and Vijay — danced to the tune of their favourite numbers on the roadside in Sector 8. “I especially came from New Delhi to join my friends and nephews to see the match together. We have been supporting Italy since the start of the World Cup. Now that our team has won, we are going to Kasauli to make merry”, said Vikas, a businessman. Local college students Seerat, Balvar, Sukhjit and Vyom chose to roam around the city in their car to express their joy. “Before the start of the match, we decided this ‘plan of action’ as both teams were equal for us. So there was no hassle for us who would win. It’s party time and we are enjoying it”, said Seerat and Co. The enthusiasm was also witnessed at Athena, Silk Lounge, Lake Club and various hotels after the culmination of the title clash. All these places installed big screens and offered various discounts, incentives, cash prizes and lucky draws to woo football fans. All these places witnessed crowds of football enthusiasts during the match. While families were seen mainly at hotels and clubs, the young crowd, mostly comprised of students, preferred the discotheques. “We are organising a dance party in which we will provide special discounts on food and beverages and give free entry passes on first-come first-served basis”, said Puneet Sharma, unit head of Athena discotheque. Over 150 fans assembled at Silk Lounge discotheque, Sector 8, to watch the match on two big screens. There were also some people who seemed disappointed by the defeat of France. Perhaps they had lost money by backing the wrong team. “I’m totally overwhelmed by all the compliments that are coming from so many different directions,” Klinsmann said after his team beat Portugal 3-1 in an action-packed third-place match yesterday that carried his high-pace, attacking signature. “I can’t put it into words. It can’t get any better than this. I need a few days to be able to understand all of this,” he said amid calls from across the country for him to stay on. Even the deafening chants of 52,000 fans repeatedly chanting his name in Klinsmann’s home city of Stuttgart could persuade the Southerner to reveal if he will carry on or bow out. “So much has crashed down upon our heads, on the team and the coaches,” said Klinsmann, 41. “We’d always warned everyone that the World Cup would be an avalanche, but we didn’t know it was going to be as massive an avalanche as this. Kahn, who earned 86 caps for Germany, was captain of the team that reached the World Cup final in 2002, where they lost 2-0 to Brazil. He also won the Golden Ball award given to the most valuable player of the 32-team tournament. But Klinsmann demoted Kahn in two stages. First, he stripped him of the captaincy two years ago and gave that to midfielder Michael Ballack. Then he made Kahn compete with understudy Lehmann, who was chosen as the number one in April. Lisbon: Portuguese striker Pedro Pauleta announced that he was ending his international career after his side lost the World Cup third-place playoff 3-1 against Germany on Saturday. “This is the saddest day of my career. Playing for this team, scoring for this team was what I most loved doing but my time has come,” the 33-year-old Paris St Germain striker told Portuguese reporters in Stuttgart. “It’s a very difficult moment because I expected to end by scoring once again but that wasn’t possible,” he added in comments broadcast on SIC television. Pauleta played 88 times for Portugal, scoring 47 goals, making him the nation’s all-time leading scorer, shattering Eusebios record of 41 goals in 64 matches. After he failed to score at Euro 2004, which Portugal hosted, critics called for coach Luiz Felipe Scolari to drop him from the national team. The Brazilian kept him on and he went on to become the most prolific scorer in European World Cup qualifying with 11 goals. But during the World Cup finals Pauleta was able to score only once, during Portugal’s 1-0 win over tournament newcomer Angola in the group stage. Ballack, capped 70 times by his country, missed the 2002 World Cup final through suspension and wanted to cure that heartache by lifting the trophy in Berlin. He led the hosts to the World Cup semifinals but lost 2-0 to Italy in extra-time and must now come to terms with the fact that he is unlikely to ever win football’s ultimate prize. “I am 29 now and a World Cup only comes along every four years. 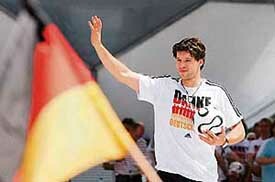 I will be almost 34 and at that age there is no guarantee that I will be there,” Ballack said in an interview with Welt am Sonntag. “I realised this could be my last chance to be a world champion.” Despite the disappointment of missing out on World Cup glory, Ballack can look forward to a new challenge after agreeing to join English champions Chelsea on a free transfer from Bayern Munich. “To capture the football fever, we will organise an auction where any football lover can come and purchase a dog of a breed from the country to which his favourite player belongs,” Viren Sharma, director of the international dog bazaar, said. For example, Ronaldinho of Brazil bid would start at Rs 55,000, Ronaldo Rs 75,000 and for Beckham, the bid would begin at Rs 65,000. Totti from Italy starts at Rs 25,000, Messi (Argentina) at Rs 21,000 and Zidane Rs 51,000. The memorandum is designed to use the world’s most popular sport as a platform for communicating a positive image of Africa, raising awareness of the continent’s potential and to fight against racism and discrimination. “Football has proved yet again it can bring people together,” FIFA President Sepp Blatter said at a signing ceremony with European Commission President Jose Manuel Barroso, South African President Thabo Mbeki and EU Development Commissioner Louis Michel. Blatter added: “We share the same message of solidarity in a world that is more and more selfish. Football can be the instrument to create a world full of hope, through better education and health.” Mbeki said football brought hope in even the most desperate of situations. Roger Federer wrapped up his fourth consecutive Wimbledon title today, finally subduing Spain’s Rafael Nadal 6-0, 7-6, 6-7, 6-3. It looked as though the world number one would run away with his eighth Grand Slam title after rampaging through the first set in 24 minutes before double French Open champion Nadal recovered to make the Swiss maestro sweat on a breezy Centre Court. Federer dropped a set for the first time at this year’s tournament as Nadal refused to surrender, but in the end he had enough grasscourt craft to become only the third man to win four straight titles here in the professional era, joining Bjorn Borg (five in a row from 1976-80) and Pete Sampras (1997-2000). Federer had been on the receiving end against the 20-year-old Nadal four times already this year, and he came out mean, moody and looking for revenge after his French Open final defeat last month. His opening-set demolition was the first 6-0 first set in a Wimbledon men’s final since Boris Becker achieved the feat against Stefan Edberg in 1989. Nadal had won 80 consecutive service games at Wimbledon en route to the final, but that sequence ended when Federer crunched a forehand to break serve at the first time of asking. For once Nadal, the first Spanish finalist for 40 years, looked overawed as he struggled for rhythm and Federer broke again to lead 4-0. Nadal saved a set point with a brilliant lob volley at 0-5 and another with his first ace, but Federer made sure at the third attempt with an exquisite backhand pass. Thoughts of a Centre Court humiliation for Nadal, the youngest men’s finalist since Becker in 1986, soon disappeared though as he finally exploded into life. A pummelled backhand winner gave him a break point at the start of the second set and Federer then miss-hit a forehand wide, prompting a trademark bicep-bulging fist pump and roar of “Vamos” from Nadal. Federer responded by carving out a break point in the fourth game, only to send a backhand over the baseline. Nadal consolidated his two-game lead with an ace. Nadal, who lost the first set of the French Open final 6-1, took the second set into tiebreak, which Federer won 7-5. Nadal won the third-set tiebreaker 7-2 to claw his way back into the match. The second seed Indian went down against her unheralded Chinese opponent Wen Cheng in a three setter, losing 16-21, 21-19, 10-21. The 16-year-old came from behind to pull off the second set and level scores but the Chinese rose to the occasion in the decider to seal the matter in her favour. Indian shuttlers had a generally bad day as none of them tasted success in any of the events yesterday. Ruth Misha and Gayatri Vartak lost their respective third round matches in girls’ singles while in the doubles Misha met a similar luck alongside Nischita. Misa lost to Megumi Taruno of Japan 12-21 7-21 without any resistance and Vartak was tamed by Stephanie Sugumaran of Malaysia 16-21, 21-23. Chopra dropped to tied-21st spot after being the leader for the first two days of the event. His previous two rounds were 66-66, and he shared the first round lead and then held it solely by two shots after two days. On the other hand, Fijian Vijay Singh shot a three-under 68 to become the sole leader after the penultimate round. There was a logjam for second as Carl Petterson (65), Matthew Goggin (66), Stewart Cink (69), Trevor Immelman (69) and Joe Ogilvie (69) were in a five-way tie for second. Tiger Woods (66) overcame his poor first round of 72 with a 67 in second and continued his progress as he tied for seventh with Jim Furyk (69) and Scott Gutchewski (69). Phil Mickleson the money leader this year disappeared down into tied 75 th place after a third round 75. Kildare (Ireland): Jeev Milkha Singh was in danger of missing his British Open berth after he carded a two-over 74 and dropped to tied-12th on a rain-hit third day at the Smurfit European Open golf championship at K Club course here on Saturday. The Indian, who was tied-fourth overnight, still could book a ticket to one of the four Majors as he was only five shots behind the leader Jose Manuel Lara (67) who was lying at nine-under 207 overall. In this connection, the council has served a show-cause notice to the PCA in general and Mr I S Bindra, President, PCA, in particular. Reacting to the notice, issued through Dr Surya Parkash, the PCA has sought time to file a reply. The council wants the PCA to stop occupying and using the land and the stadium as it contends that the council never signed the 99 years’ lease deed of 14 acres of the land on which the stadium is built. The notice also claims that no proper procedure was followed while making the lease deed. In the notice, the council has mentioned that the alleged lease deed, dated June 16, 1992, under which it was shown that the land was transferred to the PCA for a period of 99 years for a meagre amount of Rs 100 per annum was an unilateral act and had been executed by the President and the Honorary Secretary of the PCA. It alleged that the President of the PCA had put his signature misusing his capacity as Secretary, Sports Department. This shows that the alleged lease deed was never executed by the council. Instead, all the office-bearers of the PCA like the President, Vice-President and Honorary Secretary have signed the document. It further contended that while preparing the lease deed all the norms and procedures were violated. It was also alleged that Mr Bindra, who was holding various government offices at that time, had misused his position and transferred more than Rs 10 crore of government money from the departments/boards under him to benefit the PCA. An amount of Rs 30 lakh of the council was also transferred to the PCA at that time which has not been returned till date, according to the notice. It is further mentioned that the Secretary, Sports Department, Punjab Government, has no authority to lease out government land as it can be done only by the Revenue Department. Therefore, the alleged lease deed was not sustainable in the eyes of law. However, in their reply through Karanjawala & Company, the PCA and Mr Bindra termed the allegations, made by the council, as bald. They sought time for the investigation of all documents and payment receipts. “We have received the notice and seek time to examine all the relevant documents,” said Mr M P Pandove, Hony Secretary, PCA. When The Tribune asked for his comments, he said, “At the moment we can’t comment on any of the issues raised in the notice. But definitely, we will reply with total facts at the appointed time”. 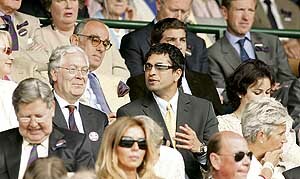 However, Mr Bindra could not be contacted as he was out of the country. It may be mentioned here that the PCA stadium has been selected as one of the four venues to hold five matches, including the first semifinal match of the ICC Champions Trophy.